Cisco’s ambition sounds a bit like science fiction. The company estimates that 99.4% of all physical objects in the world remain unconnected — all but 10 billion out of 1.5 trillion things. The value (net profit) of connecting all of those things: $14.4 trillion. Cisco sees this potential developing in the next decade, by 2022. To put that incredible number in perspective, consider global GDP, which was $70 trillion when last assessed in 2011. If global GDP were to double again over the next decade, as it has since the end of the dot-com bubble, it would rely on the Internet of Everything for a fifth of that growth. Growth is already kicking in: Cisco projects $613 billion in corporate profit worldwide this year as the Internet becomes an Internet of Everything. It is also known as IOT (internet of everything). Chomsky defines his view of education in an Enlightenment sense, in which the “highest goal in life is to inquire and create. The purpose of education from that point of view is just to help people to learn on their own. It’s you the learner who is going to achieve in the course of education and it’s really up to you to determine how you’re going to master and use it.” An essential part of this kind of education is fostering the impulse to challenge authority, think critically, and create alternatives to well-worn models. The question that plagues educational reformers at the primary and secondary levels: “Do you train for passing tests or do you train for creative inquiry? The purpose of education is a fascinating and often controversial topic and requires a bit of reflection. From RDF Data Cube Vocabulary. This document was published by the Government Linked Data Working Group as a Candidate Recommendation. There are many situations where it would be useful to be able to publish multi-dimensional data, such as statistics, on the web in such a way that it can be linked to related data sets and concepts. The Data Cube vocabulary provides a means to do this using the W3CRDF (Resource Description Framework) standard. The model underpinning the Data Cube vocabulary is compatible with the cube model that underlies SDMX (Statistical Data and Metadata eXchange), an ISO standard for exchanging and sharing statistical data and metadata among organizations. The Data Cube vocabulary is a core foundation which supports extension vocabularies to enable publication of other aspects of statistical data flows or other multi-dimensional data sets. This proposed standard leverages other well known standars like SKOS, Dublin Core , FOAF, admingeo etc. A list of statistical datasets using the Data Cube Vocabulary. This ontology is designed to enable publication of information on organizations and organizational structures including governmental organizations. It is intended to provide a generic, reusable core ontology that can be extended or specialized for use in particular situations. Will be interesting to watch the adoption rate. Can certainly help improve the semantics of search for and within organizations. 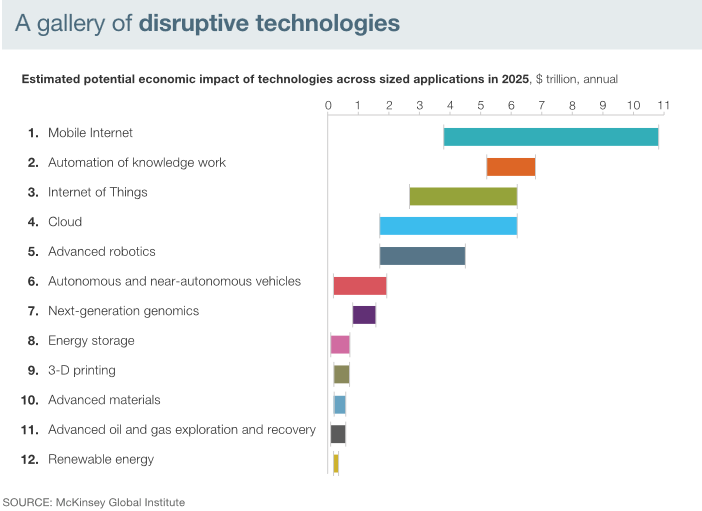 McKinsey says that this report is neither predictive nor comprehensive. These are enablers for big shifts. It will be interesting to watch how they play out. Over the next few months, we will track some of these and keep you posted as well. Will baby Watson Create a Cognitive Revolution? IBM believes success with Watson in multiple domains will trigger a new computing revolution, one focused on cognitive computing systems. Such systems will do for knowledge work what the early data oriented systems did for transactional work. The goal is not to replace human experts but to vastly amplify their reach and effectiveness. Finding or creating an innovation calling takes time. And you need certain skills and habits of mind to do it. While you most likely won’t find it by reading a book you can cultivate the skills and habits needed to eventually develop one. The work is guided by a set of 25 knowledge cards. The knowledge cards describe a proven practice for getting in touch with your innovation calling. The idea is to build these practices into your daily routine until they form habits. Are you a skilled Observer? How often do you really pay attention to what you see, touch, smell, taste and hear? And when you do pay attention how do you do it? Do you use specific tools and techniques? If you want to be an effective designer or innovator you need to be an active observer. Indeed, good observation skills are important for all professions and everyday life. A lot of people, when they have that Big Idea moment, throw themselves into writing it all down, planning it out, and doing things about the thing. Not the thing itself. In manufacturing, the potential for cyber-physical systems to improve productivity in the production process and the supply chain is vast. Consider processes that govern themselves, where smart products can take corrective action to avoid damages and where individual parts are automatically replenished. Such technologies already exist and could drive what some German industry leaders call the fourth industrial revolution—following the steam engine, the conveyor belt, and the first phase of IT and automation technology. What opportunities and challenges lie ahead for manufacturers—and what will it take to win? “Learning in advance” doesn’t work in a realtime world, so learning and work have converged. Learning is simply an aspect of getting the job done. Learning new things — sometimes by inventing them — is an obligation of corporate citizens. Most of this learning takes place in the workplace. The learning platform is the organization itself, not some separate entity. I call these learning aspects of an organization its Workscape. A Workscape is a metaphorical space. The Workscape can include the water cooler, the Friday beer bust, the conversation nook at the office, wi-fi in the cafeteria, the enterprise culture, in-house communications, access to information, cultural norms around sharing and disclosure, tolerance for nonconformity, risk aversion, organizational structure, worker autonomy, and virtually any aspect of the company that can be tweaked to enable people to Work Smarter. Don’t miss reading Jay’s post. I would actually print the starter list and put it somewhere where every one can see.